UOITC celebrated the graduation of its first graduates (Victory and Development). UOITC celebrated the graduation of its first graduates (Victory and Development) The ceremony was attended by the representative of the Minister of Higher Education and Scientific Research, the Scientific Research undersecretary, Dr. Fuad Qasim Mohammed, and a number of Iraqi university presidents (Wasit, Karkh for Science), some general directors in the ministry and the families of graduate students. The representative of the Minister of Higher Education, in his speech, congratulated the President of the Faculty of Information Technology and Communications on the occasion of the graduation of the first groub titeld (Victory and Development), praising the important role of the University of Information Technology and Communications and its scientific output of graduates and researchers in the field of informatics. The Scientific Research undersecretary of the ministry said that the celebrations of university come at a distinguished time to contribute to the building of the society. 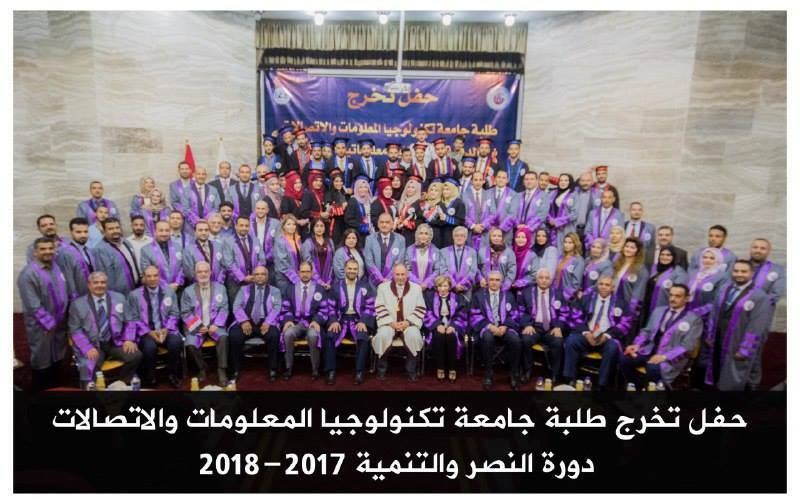 The university has proved its scientific ability in facing the technical challenges and overcoming difficulties and hard work and providing technical and advisory services to all government departments. The efforts of the e-governance project, the portal and the electronic portal to accept students in Iraqi universities and government and private colleges. He addressed the graduate students that the university is keen to transfer professional and scientific experience to the graduates to serve the labor market and the urgent need in the field of information and communication technology. It has made great efforts in developing the university's facilities, Getting closer to the edges of science as well as preparing students and arming them with the necessary skills for the labor market. For his part, President of the University Dr. Abbas Mohsen al-Bakri said, after welcoming the guests and the official attendance and congratulating the teachers and graduate students and their families,that the main objective sought by the university is to be a scientific product meet the needs of the community and future vision to meet the labor market. Al-Bakri also pointed to the formation of a scientific committee to keep pace with the developments and review the curricula and follow up the changes to meet the needs of the community in different sectors in advance of some companies that have employed university students. In the speech of the representative of the graduate students who is the first student on his class, Ali Jassem, on behalf of the graduates, thanked the university and its presidency and the Deanship of Information Technology College and professors who taught them and developed their skills, praising the role of the university in an attempt to create the best conditions and provide the educational means and scientific laboratories and advanced curricula to keep up with the revolution And the first student praised all teachers, especially those who coordinated with some companies and departments in order to train and develop the skills of students. After that, the President of the University ,Assistant for scientific affairs Dr. Jane Jalil Astefan read the administrative order to grant the certificate of the Bachelor's degree for graduate students each according to his specialization, and in turn the President of the University read the university grantor for the bachelor's degree in computer science. 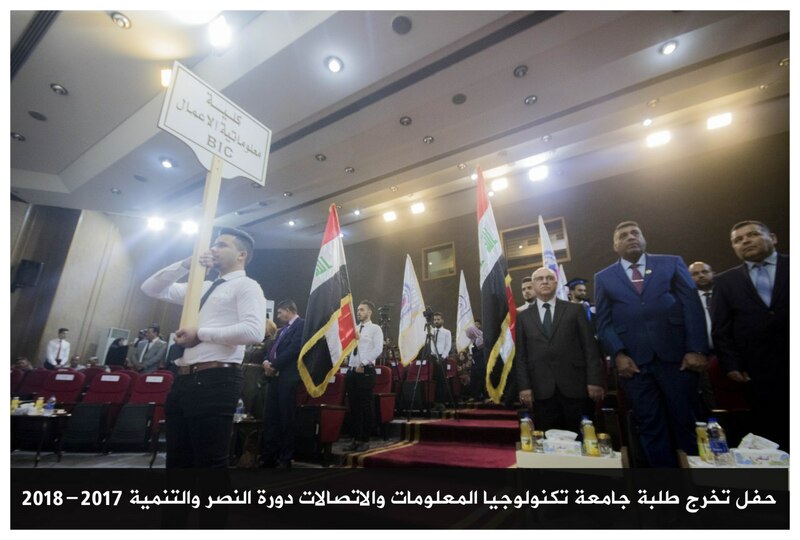 The graduation ceremony was held by graduate students, followed by words and poems that sang with love of the homeland and defense of its land and holy places. The gifts were distributed to the first students. The university president presented the university's shield to the technical undersecretary of the Ministry of Higher Education and Scientific Research.